End In Sight For Meltem Project ? These beautiful photos of ATR-72-600 TMPA were taken by Lidie Berendsen in Turin Airport and modified by me. 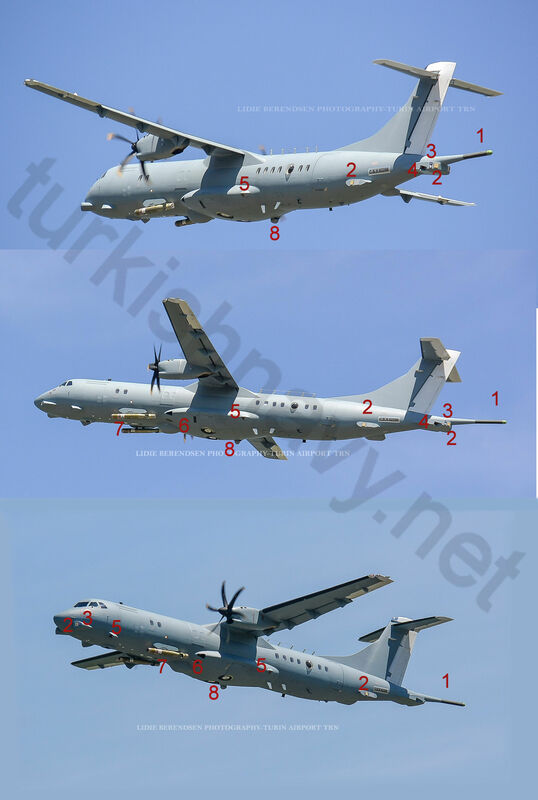 A new batch of photos from Turkish Navy ATR-72-600 TMPA plane has emerged. The photos from last year showed an unpainted airplane where as this year the plane seems to be fully painted. The first plane should have been delivered back in February 2017. But like the Meltem-I and Meltem_II projects, this Meltem-III has been too plagued by notorious delays. In July 2005, Italian Prime Minister Mr. Berlusconi and his Turkish counterpart Mr. Erdoğan signed a deal on acquisition of 10 maritime patrol planes based on Alenia’s ATR-72 500 turboprop aircraft. According to the $219-million contract the initial deliveries were supposed to be in 2010. The first ATR-72 500 arrived in Turkish Aerospace Industries in February 2008. TAI worked as Alenia’s local sub-contractor, carrying out all modifications from the base airframe to the ATR-72 MPA configuration. In May 2013, suddenly there was a big change in the project. The project was downsized from 10 planes to 8. 2 utility models for personnel and cargo transportation, and 6 armed maritime patrol models. The good part of this rearrangement was the upgrade from ATR-72 500 which, was no longer in production, to ATR-72 600. In July 2013 the first utility model was delivered to Turkish Navy. In August 2013 the first base ATR-72 600 was delivered to TAI for the changes to MPA configuration. I think, the plane, seen in the above photo is this first plane. These planes are armed with two Mk-46 and Mk-54 lightweight torpedoes and will carry Thales AMASCOS maritime patrol mission system that integrates an array of sensors. According to the original timeline the first plane should have been already in service and the remaining ones join the service in 2018. I have no idea about the new schedule. And if you have time to read the saga of the Turkish Navy’s maritime patrol plane aquisation project you can click here. One Response to End In Sight For Meltem Project ? THE END OF THE PROGRAM TO LOOKING FOR A BRAND NEW NAVAL AIRCRAFT FOR EARLY WARNING SYSTEM.